The commercial hub of Kerala, this centrally located district of Kerala is considered as the gateway to Kerala for travelers and tourists coming to Kerala. 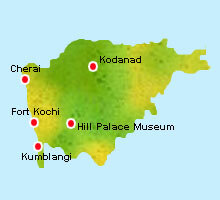 A cosmopolitan city in comparison to other cities of Kerala, Ernakulam has a well-developed port and an international airport. Kochi in Ernakulam is referred to as the ‘Queen of the Arabian Sea’ and has in store for visitors some heritage sites as well as historic ones with a landscape crisscrossed by backwaters, which meet the Arabian Sea at various points.